1. The Castlefield basin and the Great Northern railway viaduct (1894). In a rather secluded quarter of Manchester’s city centre lies Castlefield, a dramatic urban landscape that has become synonymous with collective images of Victorian urban industrialisation. With its tangle of waterways and railways, suspended on many vertical levels, it is almost as if the built environment here were deliberately created to make the human seem tiny and insignificant (1). Each successive vertical level represents a new phase of industrialisation: on the ground (and sometimes below the ground) are the canals – the Bridgewater and Rochdale – completed by the beginning of the 19th century; suspended above these, in a dizzying, seemingly unplanned formation, are the railway viaducts (2), built in periods of development in the 1840s, 1870s and 1890s, and characterised by massive brick arches in the earlier viaducts to enormous tubular steel columns in the Great Northern viaduct (1894). 2. Castlefield basin: the junction of the Bridgwater and Rochdale canals with an 1849 viaduct (centre left), a steel viaduct from the 1870s (top left) and the Great Northern viaduct from 1894 (right). Even for early Victorian observers, such a landscape would have been associated with the idea of the sublime, that is, feelings of awe, even terror, generated by massive structures, overwhelming spectacles and a feeling of insignificance in the face of forces beyond human control. In the mid 18th century, the sublime was usually associated with a Romantic response to nature – savage storms, rough seas, great mountains – but, by the early 19th century, it was increasingly ascribed to the new wonders of industry, such as the iron furnaces at Coalbrookdale, the giant cotton mills in Ancoats, and later railway stations, viaducts and trains. 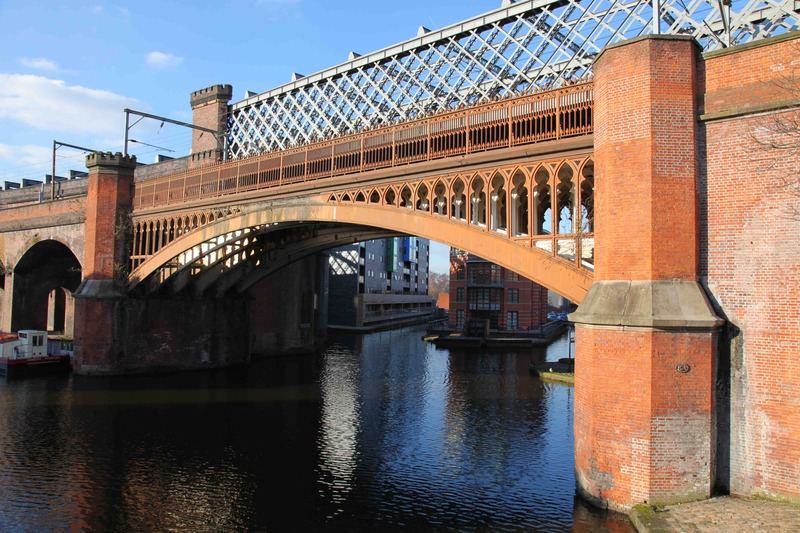 Today, we have a tendency to regard these kinds of structures as rational objects, planned only according to the dictates of reason and utility; yet, here, in Castlefield, they are given rhetorical flourishes by their Victorian engineers that accentuate their sense of power: castellated turrets on the viaducts, gothic arches in the iron bridges (3), and stripped-down Egyptian capitals on the enormous steel columns. 3. Castellated towers and gothic ironwork of the Manchester South Junction & Altringham Railway viaduct (1849) with an 1870s steel lattice girder viaduct behind. 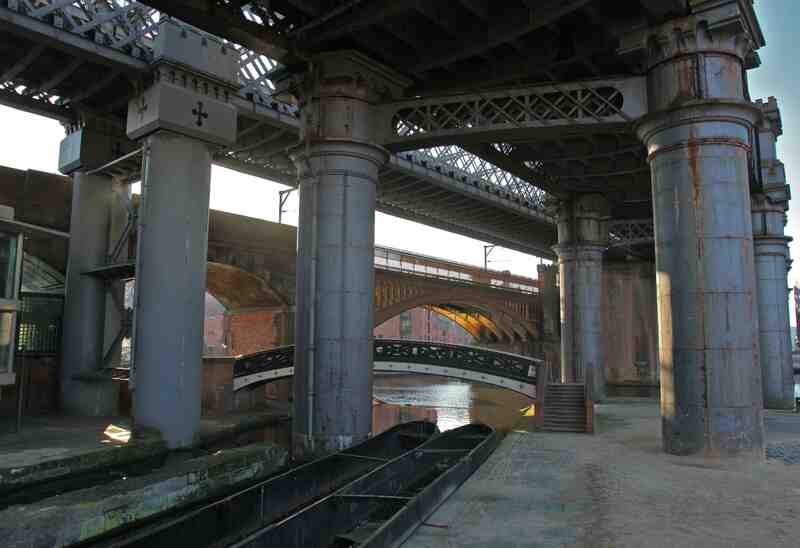 Castlefield’s vertical structure also reflects a very different conception of urban infrastructure than our own. Today, urban utilities – railways, water pipes, sewers, telecommunication cables – are generally planned to be as invisible as possible, either hidden beneath the ground or enclosed in tunnels and embankments. In the early Victorian period, new forms of urban infrastructure were unashamedly visible: canals were driven through towns and cities, railways sped over houses on viaducts, giant sewers were even built inside embankments and bridges rather than under the ground. In comparison with the sealed-off infrastructure of today’s cities, there’s something liberating – even truthful – about Castlefield’s sheer visibility, one that brings the hidden mechanisms of urban organisation out into the open in a celebration of their layered complexity. 4. View of the original shipping holes in the Middle Warehouse, built from 1828 to 1831 and converted into offices and apartments in 1988. 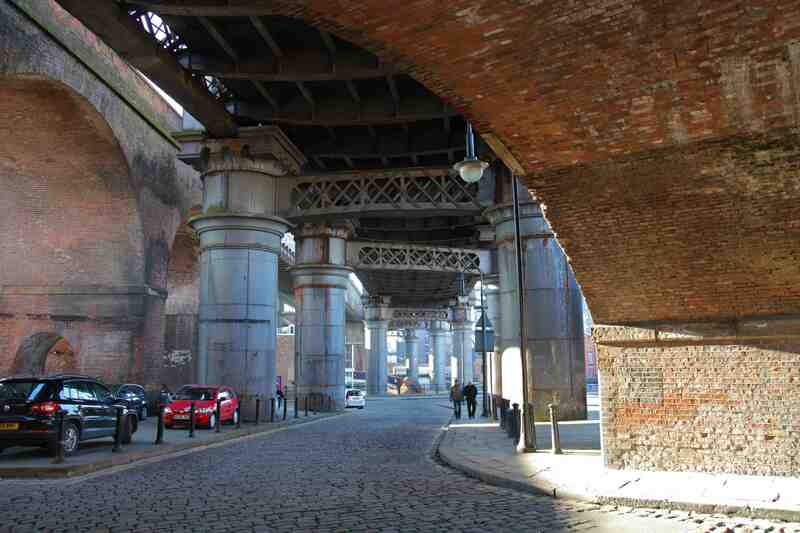 Today, Castlefield retains its distinct atmosphere largely as a result of careful management. Designated a conservation area in 1980, after years of neglect and dereliction, it became the UK’s first designated Urban Heritage Park in 1982. 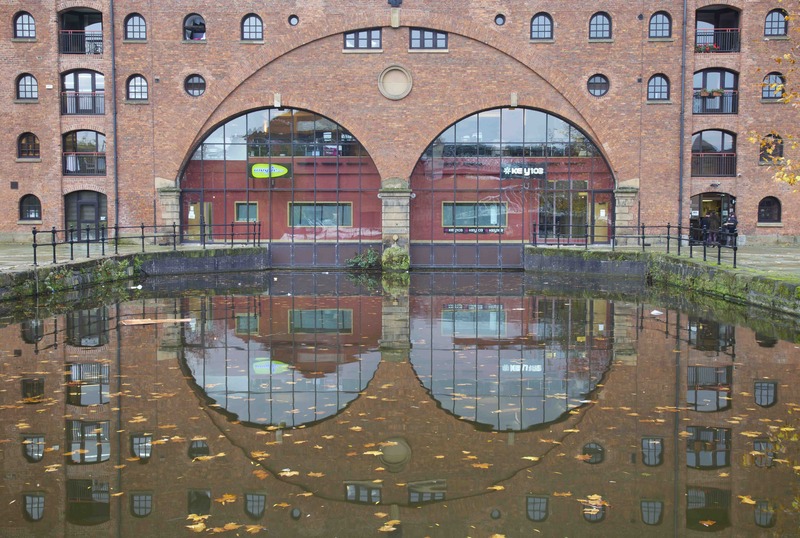 Amid the overpowering industrial structures are more recent interventions: a group of bars and restaurants taking advantage of the waterside location and dramatic views; modern footbridges which mirror in miniature the forms of the viaducts above them; and careful conversions of the canal-side warehouses into offices and apartments (4). 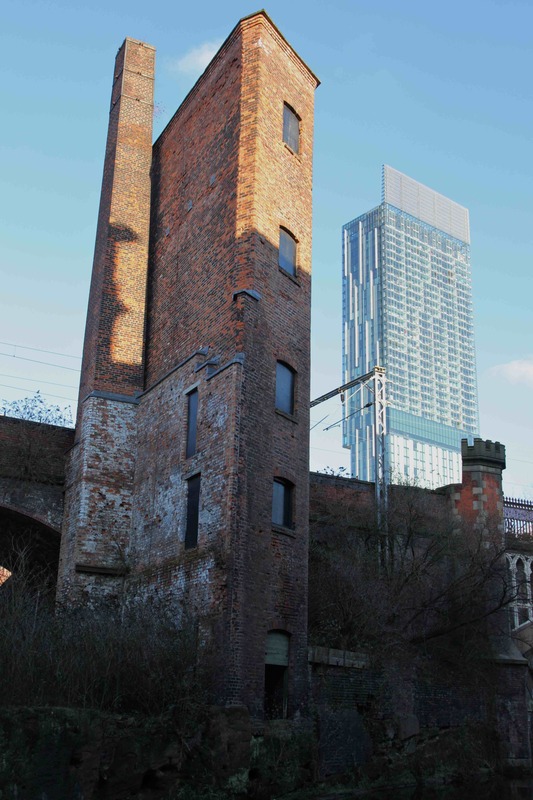 And it’s from here that the otherwise brazenly individualistic form of the 47-storey Beetham Tower (2006) suddenly becomes a mirror of a much older industrial structure with the same visual impact – an architectural conversation across time (5). 5. An early 19th-century factory along the Rochdale Canal with the Beetham Tower (2006) behind. Great post. Image of the shipping holes is stunning. excellent.. how can I uses these pictures for a student report?